Ludwig Mies van der Rohe was born Maria Ludwig Michael Mies on March 27, 1886 in Aachen, the son of a master stonemason. Although he had never studied Architecture in 1908 he was appointed project leader by Peter Behrens and in 1913 he opened his own architecture firm. Mies van der Rohe’s forte was ambitious villa projects for the progressive upper classes and the educated middle classes. His style progressed from an austere neoclassicism in the 1920s (Haus Urbig, Haus Perls), to the stylistic vocabulary of international modern architecture (Haus Tugendhat, Haus Esters, Haus Lange). His global renown as an architect is based not only on his outstanding residential buildings, but also on his expressionist glass high-rise designs dating from the early 1920s and particularly on his German Pavilion for the 1929 World’s Fair in Barcelona (“Barcelona Pavilion”). He also designed an apartment building for the Weißenhofsiedlung (Weissenhof Colony) built under his management in Stuttgart, a project in which architects such as Le Corbusier, Walter Gropius, J.J.P. Oud, Josef Frank, Ferdinand Kramer, Hans Scharoun and Mart Stam were also involved. Mies van der Rohe’s modern edifices are distinguished by an extreme paring down both of overall shape and of individual details as well, to some extent, by the use of extremely high grade materials. This also applies to the furniture he designed to adorn his buildings. Examples include the Barcelona Pavilion and Haus Tugendhat. His famous Barcelona Chair for example is a greatly pared-down reinterpretation of a heavy-duty upholstered leather armchair. 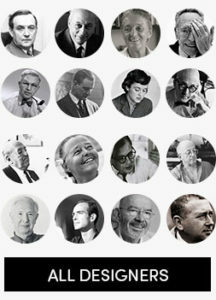 Mies van der Rohe was Director of the Bauhaus from 1930 until it closed in 1932. When the Nazis seized power, his orders dried up and he finally felt compelled to emigrate to the United States in 1938. He became a university professor in Chicago and established his own firm. He subsequently produced important designs such as the campus for the Illinois Institute of Technology, Farnsworth House, the Seagram Building and the Neue Nationalgalerie. Mies died in Chicago in 1969. Mies van der Rohe had a major influence on the architecture of the 20th century and was instrumental in paving the way for modern architecture. His numerous furniture designs such as the Barcelona Chair, the Brno Chair, the Tugendhat Chair and the so-called “Weissenhof Chair” have long since become classics and are still in production today.